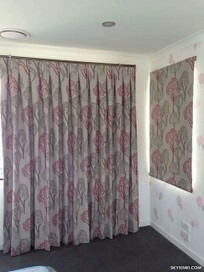 Our Custom Made Window Treatment Service With Extensive Range Includes Styles From The Best Fabric House In New Zealand. Custom Made Curtains, Sheers, Roman / Roller / Vertical / Wooden / PVC /Venetian Blinds, Tracks/Rod­s, Cushions And Installati­on Services. *Free IN-HOME Measure and Quote. *Through­out New Zealand By Courier Or Delivery. Packaged Carefully. *Free In-Home Measure And Quote. We Can Also Guide You Through The Measuring Process By Phone Or Email. *Supply Sheer / Curtain Tracks / Rods. *All Finished Blinds And Curtains Are Ready To Hang With Accessories.